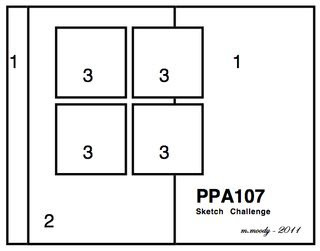 Papercrafts by Patti: PPA107 Sketch! Pals Paper Arts is proud to present a great sketch by our Design Team Member Margaret Moody. She comes up with these sketches once a month and we are always eager to use them to inspire us! I needed to keep my card simple, and I already had my sketch to get me started, so I used my Color Coach (pictured above) to give me some color inspiration. I got started with Poppy Parade, Baja Breeze and So Saffron. I hope you like looking at my card. If you would be so kind, (as many of you usually do), I would love it if you left me a comment! I really look forward to reading each and every one, even though I cannot answer all of them! Patti what a great card. LOVE that stamp set and can't use it enough. I really like your colors... have not purchased the color coach, but so glad you "showed" it in the photo. I'm so visual and it give a good size comparision in your pic. Love the bright flowers against the subtle background! And the stamping on the DSP is super! Beautiful, Patti! I knew I was going to love it! The stamped DSP is perfect! The color combination was an excellent choice for this set! Great card! Simply stunning, Patti! Gotta love that color coach ... awesome colors here! You are so clever to use DSP for the images. That sure made quick work of this design challenge and a great way to make a quick card! I think I'll borrow (steal) that idea! I love how you stamped the flowers for the square images. Great use of the color coach. Patti - this is so pretty! I love the clean classic look you created. The colors are also dynamite! I love the background and how u stamped on the dsp. So clever, i must try this!